The juxtaposition of modern techy art tools and traditional ink and paper is my latest art study. I tend to move from one media to the next, and this seems natural after years of architecture studio (sketchbook to computer and back again.) Although a cute stylus and Penultimate are fun toys, and syncing sketch concepts with tidy client notebooks in Evernote is handy, there are some things a pen and paper can do for me that a computer never will. I enjoy the timelessness of sketches, a folksier aesthetic, and a break from the screen. 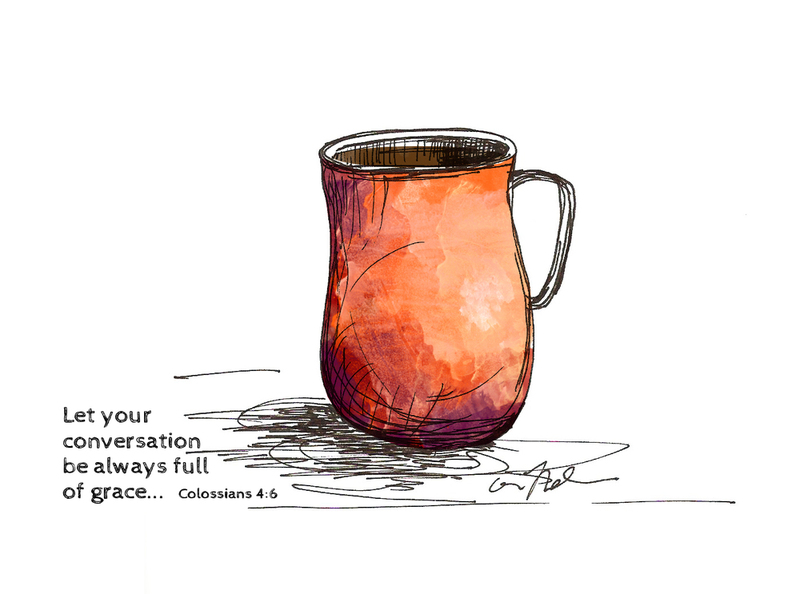 Coffee mug and Colossians Christian art illustration Colossians 4:6 "Let your conversation be always full of grace." A constant and timeless creative companion is coffee. I prefer coffee from my local Alterra. To stay on top of the color trends, keep an eye on Pantone. Organize your business, your personal life, and your creative ideas with Evernote, a free program. Continue learning for free through your local library with both hard copies and e-books. License your creative work and search the creative commons for media you can use. Keep track of your income and expenses with this free program, linked to your PayPal and Etsy shop accounts. Advertise your creative services for free, search the ads for potential clients. Ship your handmade items using affordable eco-friendly shipping materials. Be inspired, share your creations. Create playlists of your favorite inspirational songs to listen to while you work, or while you unwind. Do you have some favorite creative resources? Please share.